For this three-month long project, I worked on a small team that focused on the points of online/offline integration in learning environments. Early in the process, our team was funded by the d.school to travel to Portland, OR, where we conducted empathy research on the intersection between online and offline experiences. We specifically noticed both tension and integration in the reading and news industries, where technology appeared to sometimes threaten but other times complement the tangible experience of buying a book and reading a newspaper. Our fascination carried us to Powell's Bookstore, where we observed and interviewed customers, salespeople, and bookstore managers about the modern-day reading experience in both online and offline contexts. One of the insights we gathered in Oregon was that customers valued the social experience of looking at products and sharing their thoughts and information with others. We uncovered our primary user and need: students wanted to become teachers. For the final iteration of our prototype, we designed a creative online platform known as "Open Mic Academia." Empower students to further understand and connect with academic material through the valued social experience of teaching and learning from others. Accommodate for different learning styles and types of learners (i.e. auditory, kinesthetic, visual). Promote the open, global accessibility of knowledge and push past the exclusivity of university-centered courses. In May 2014, a year after my time in the course had concluded, the students and teaching team all reconnected for a Final Expo Event in the d.school. "What is the future of the on-campus experience in the age of online learning? 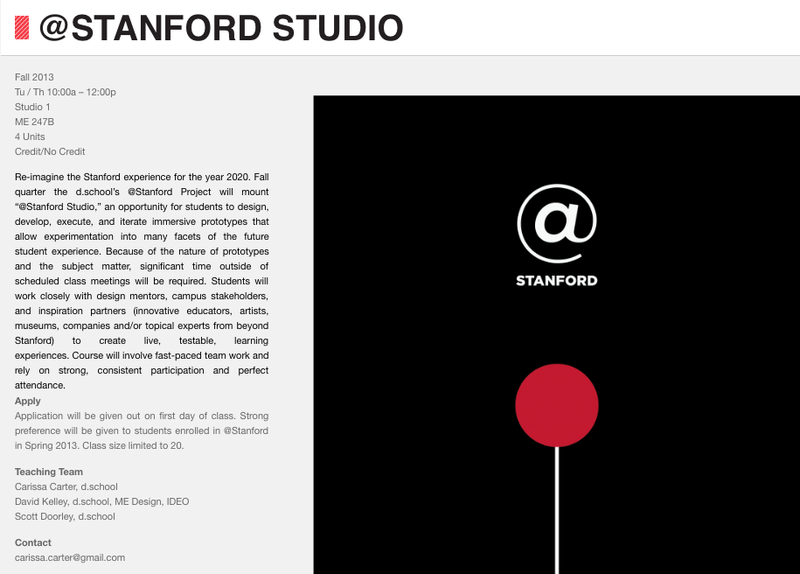 On May 1st, 2014, Stanford faculty, staff, and students gathered to experiment with the future."